Arden Grange Ltd was founded by Graham and Wendy Stephens in 1996 and the company is situated in the beautiful Sussex countryside. Prior to founding their pet food business both Graham and Wendy had been breeding and showing their highly acclaimed Ardenburg German Shepherds for a number of years. Arden Grange was possibly the first product of its kind to be able to name human-grade fresh chicken as its prime ingredient. 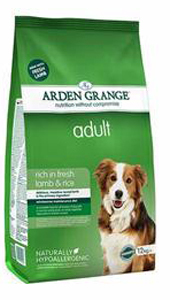 Arden Grange falls neatly into the category of 'Natural' foods alongside Burns Pet Nutrition and others, using a single source of good quality named protein, and no cheap fillers, but generally at a more accessible price. 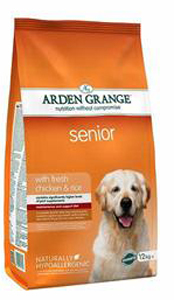 You can buy cheaper foods for dogs, but you won't find too many natural foods that offer as good value as Arden Grange. Chicken meat meal (22%), rice (22%), maize, beet pulp, fresh chicken (5%), chicken digest, chicken oil, linseed, whole dried egg, yeast, fishmeal, fish oil, glucosamine (740mg/kg), MSM (740mg/kg), prebiotic FOS, prebiotic MOS, chondroitin (520mg/kg), cranberries, yucca extract, nucleotides. Nutritional Additives (per kg) Vitamins: Vitamin A 18,000 IU, Vitamin D3 1,300 IU, Vitamin E 126 IU. Trace Elements: Zinc chelate of amino acid hydrate 250mg, Zinc sulphate monohydrate 208mg, Ferrous sulphate monohydrate 125mg, Manganese sulphate monohydrate 87mg, Cupric sulphate pentahydrate 30mg, Copper chelate of amino acid hydrate 25mg, Ferrous chelate of amino acid hydrate 21mg, Calcium iodate anhydrous 1.8mg, Sodium selenite 0.5mg. Antioxidants (rosemary and tocopherol-rich extracts). Lamb (Lamb meat meal 23%, fresh lamb 17.5%), rice, fresh lamb (17.5%), rice (26%), maize, chicken oil, beet pulp, whole dried egg, chicken digest, linseed, fish meal, fish oil, yeast, prebiotic FOS, prebiotic MOS, yucca extract, Glucosamine, MSM, Chondroitin, cranberry, nucleotides. Nutritional Additives (per kg) Vitamins: Vitamin A 18,000 IU, Vitamin D3 1,300 IU, Vitamin E 126 IU. Trace Elements: Omega-3 0.71%, Omega-6 3.26%, Zinc chelate of amino acid hydrate 250mg, Zinc sulphate monohydrate 208mg, Ferrous sulphate monohydrate 125mg, Manganese sulphate monohydrate 87mg, Cupric sulphate pentahydrate 30mg, Copper chelate of amino acid hydrate 25mg, Calcium iodate anhydrous 1.8mg, Sodium selenite 0.5mg. Antioxidants (rosemary and tocopherol-rich extracts).